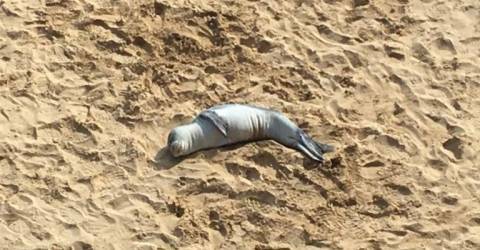 Various sources report that there are calls for the monk seal cub which has been in Porto Santo since the 10th of this month to be transported back to the Desertas Islands, its natural habitat. 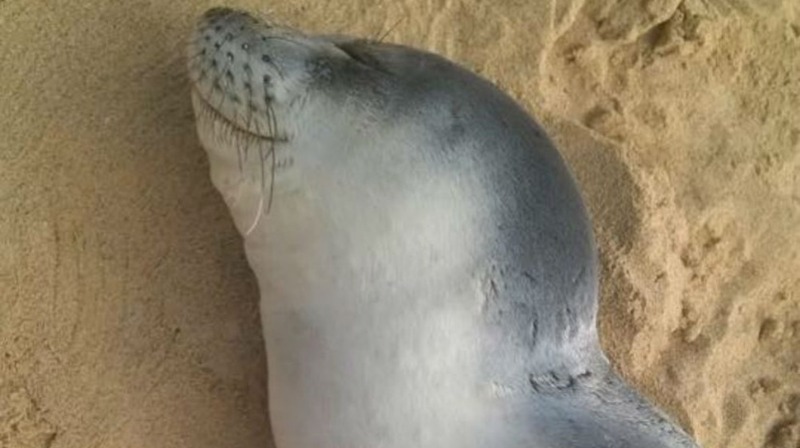 The Institute for Forests and Nature Conservation (IFCN) apparently recognises that the monk seal, or sea-wolf, is in a completely unusual environment. Paulo Oliveira from IFCN explained that the animal, believed to have been born in November, was on one of its first trips of exploration and found conditions on Porto Santo that allowed it to stay. The monk seal’s behaviour has been regular: disappearing at night to go hunting and feeding, returning later in the morning to rest on the island’s famous golden sand. Its presence, which has attracted a lot of media attention, has forced the IFCN to build a safety zone for the sea lion which been observed both by a vet and a biologist from the IFCN. The first sighting happened last Wednesday when, to the surprise of many, it appeared on the beach in Porto Santo and has subsequently chosen not to leave. But Paulo Oliveira acknowledges that this is not an ideal situation for the welfare of the animal and thinks if the cub does not go back to the Desertas Islands of its own accord, then the IFCN itself should transport it back to its correct habitat, although the animal at this age already weighs between 80 and 90 kilos. “There is such a possibility that if the animal voluntarily does not leave the place, it will be collected and taken to the [Desertas Islands] where it was born. This is because we have an exact indication of where it was born, a place which it will recognise and where it will get better”, he said. The monk seal or monk seal, Monachus monachus, as it is known locally, is the rarest seal in the world and a species considered in critical danger by the International Union for Conservation of nature. In Portugal, it occurs only in the archipelago of Madeira, more specifically in the Desertas Islands. The Natural Park Service of Madeira initiated a project for the conservation of the monk seal and its habitat in 1988, which led to the creation of the Protected Area of ​​the Desertas Islands in 1990, which, meanwhile, became the Nature Reserve in 1995. Peter has sent a not entirely unconnected link to a seal being injured by a piece of plastic debris near Kings Lynn. RCPCA staff have nicknamed him “Sir David”. He also forwarded a link to a weather forecast for the next week that is as indifferent as the last two. She has been enjoying a little holiday on the Calheta beach up to now. She doesn’t seem to be stresed in any way so it is a pity to disturb her. Thank you Admin linking bbc link about the seal. They so much plastics about and even toys can be dangerous to wild life, Could the plastics hoops be designed they brake in half with in side pressure, or better still please dont take plastics including hoops on the beach.